When we told you about the possibility of a new Chevy-branded compact car yesterday, the howls of lamentation quickly followed, as long-repressed memories of awful bowtie-badged compacts bubbled back into consciousness. But if you think those old Chevettes, Toyota-based Novas, and Citations were bad, you're forgetting about the real champion of awesomely awful American hatchbacks: AMC. 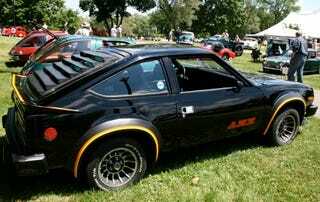 Yes, as the creators of the infamous Gremlin, the asymmetric Pacer, and the tape-stripe-tastic Spirit AMX, the American Motors Corporation will forever be remembered for making the worst American hatchbacks in history. But they're so ugly and quirky that they've actually moved full-circle and become lovable over the years. Well — at least the Gremlin and Pacer have. The world might need some more time to really appreciate the glory that is the louvered-rear, "rally-tuned" special that was the Spirit AMX. This 1980 model was the last car from AMC to wear the once-respected AMX badge. Underhood was a 4.2-liter inline six, which wasn't as bad as the hamster-powered four-banger in a Chevette, but not exactly a pavement-melter either. Be that as it may, have you ever seen a malaise-era compact look so badass? Didn't think so.